Summary of the situation . The plan to develop the allotment site for housing as part of the North East Christchurch Development has been published as part of a ‘Core Strategy’ by Christchurch Borough Council. The Core Strategy is currently being examined by a Planning Inspector. Amongst the issues she is checking on is the fact that the Council has not yet been able to say where the site will move to. 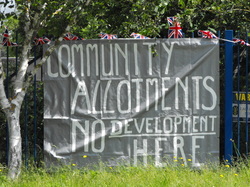 The Association, in line with the views expressed by members at the last AGM, is putting forward the view that the site should remain where it is. The ‘Examination in Public’ (EIP) starts on Tuesday 10th September with the issue of the allotment site being dealt with on Tuesday 17th September. The Association has submitted its view to the Inspector to emphasise the evidence submitted to the consultation that took place prior to the publication of the Core Strategy. Further information will be added on the site as it becomes available.